“An overseas empire produces a vast sea of paper,” John Darwin writes. That sea — wide, deep and often treacherous — is what remains of the British Empire for historians to trawl, though few attempt to chart the whole of it in one relatively compact volume. Darwin managed something similar with his previous books “The Empire Project: The Rise and Fall of the British World-System, 1830-1970” and “After Tamerlane: The Global History of Empire Since 1405” — emerging from the imperial brine with poise and balance where lesser historians would have beached themselves like lost whales or glugged down to the depths, tangled in the tentacles of a giant squid. 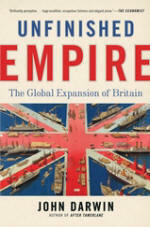 In “Unfinished Empire,” he turns his attention to the British Empire’s why, who and how: small words that signify very big questions.